1982 introduced a new concept in Technic: Universal Building Sets. Every set up to this point included ideas or instructions for at least one alternate model, but these were the first sets for which there really was no main model, just a variety of instructions for a variety of models. This was also the first year that the term "Technic" was officially used on the packaging in Europe. The sets came in three different sizes from small to large, and one set included an electric motor for the first time. Motors had previously been available in supplemental sets, but this was the first time one was included with a standard set. 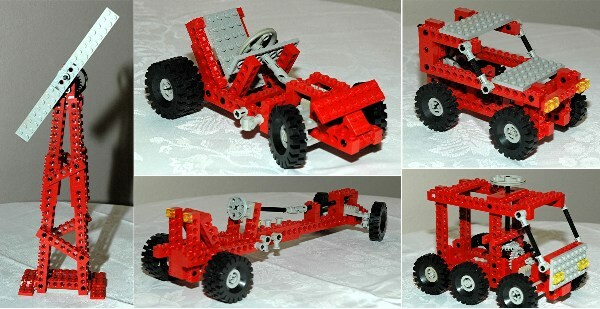 The small red set builds mostly vehicles with steering. 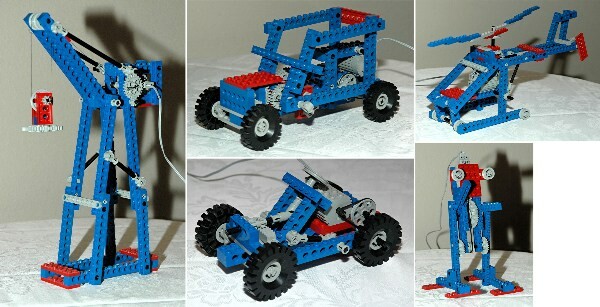 The blue set builds similar models but adds a motor. The yellow set is quite large and also includes a single piston reciprocating engine and a differential gear. The friction connector was also introduced this year. It is hard to believe that there was ever a time when Technic sets did not include this part. 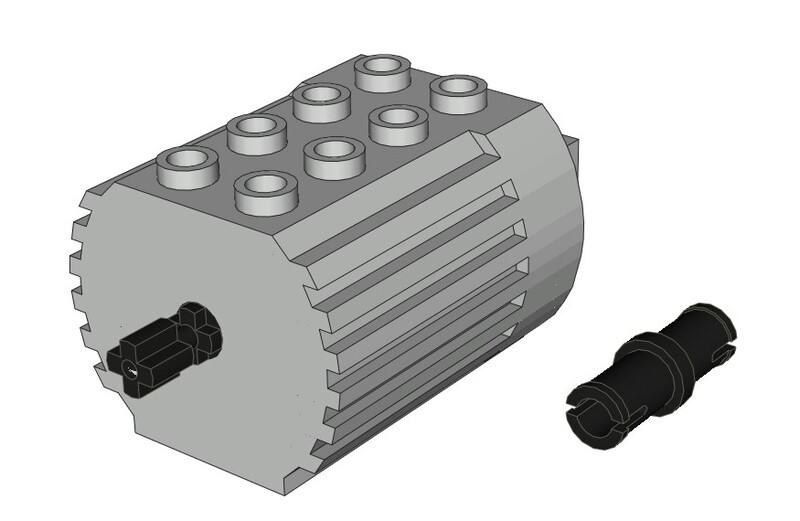 It is, without a doubt, the most numerous part in Technic history with some later sets including hundreds of copies! It would come to dominate the construction method of Technic beams, but this year was the first time it was seen. Perhaps the most ubiquitous of all Technic parts, the friction pin, was introduced this year. At first it may look just like a standard Technic pin, but there is an important difference. Standard pins rotate freely within the holes in beams, and are removed fairly easily. The friction pin has axial ridges along its length which make it fit snugly. So snugly, in fact, that it is extremely difficult to remove them. A later modification to this part would fix the problem, but early pins are notoriously difficult to remove without resorting to metal tools which damages the part. 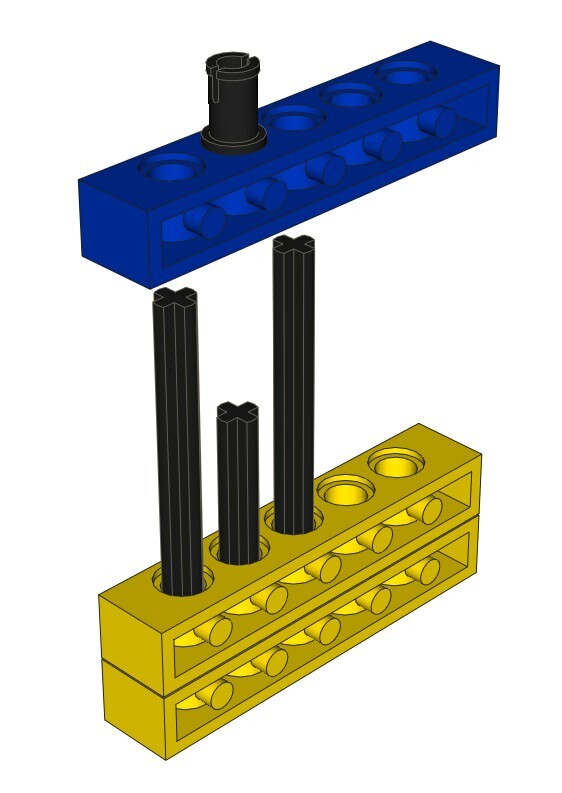 One solution is to make a tool as shown in the lower picture to push them out. Also new for this year was the first motor actually included in a regular set. This motor runs on 4.5V using a battery box with 3 C-cell batteries in series. The motor is DC, so there is no incorrect way to hook up the wires; reversing the polarity simply reverses the direction. The motor output is a standard Technic axle form to accept gears, but it also has a slot in it which can drive a belt. The battery box is the same profile as the motor but much longer. There is also a three position switch (forward-off-reverse) which can be placed in series between the motor and the battery box. The same motor was previously available in Supplemental Set 870, but with a different battery box. This motor was only ever included in Universal Sets and Supplemental Sets.